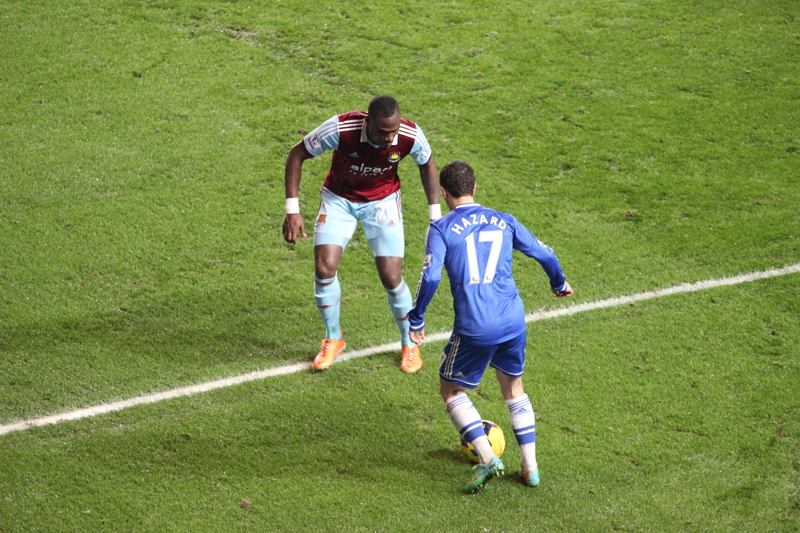 Chelsea vs. West Ham United : 29 January 2014. As I picked up Lord Parky and his son-in-law Kris at around 4pm, there was a good ‘’buzz” about the evening game with West Ham United. After the distraction of cup football on Sunday, there was the reassuring feeling of normality being restored for a run-of-the-mill league game. This was a bread and butter game, although this one was important enough – with various sub-plots beneath the surface – to resemble a cheese-stuffed crust deep pan pizza with all the toppings known to mankind. Chelsea versus West Ham United is always one of the home games of each season. Maybe not on a par with the London derbies against the ugly sisters from North London, but one which still resonates after all of these years. It had been a busy day thus far. I had woken up at 5am to work an early shift in order to pay a quick visit to my steadily improving mother at the hospital in Bath. Mum’s smiles certainly cheered me. It seems that there are few subjects that I’m unable to wrap at least one football story around. So, as is my wont, here is my Royal United Hospital / football story. Back in the early ‘seventies, it seemed that I spent a ridiculously disproportionate amount of time visiting various ailing elderly relatives at the largest hospital in my home area. My dear gran had both hips replaced on two separate occasions and, of course, I didn’t mind visiting her. It was all of the others; distant aunts and uncles, plus neighbours and even some people who I was unfamiliar with (why are we visiting THEM?) from various towns and villages who I hardly ever saw in normal circumstances, yet found myself visiting ad infinitum. The almost weekly Sunday trudge through the streets of Bath and the oh-so familiar pilgrimage to the “RUH” used to be bore me rigid. The only thing which got me through the awful tedium was the promise of being able to disappear off to the day room at the end of each ward in order to watch “The Big Match” which used to air after lunch each Sunday. Often Dad would accompany me; he, too, was no doubt bored to distraction with all of the bedside small talk. If the truth be known, I am sure – such was the acknowledgement from my parents of my love for football – that the Sunday visits were conveniently timed for me to be able to bugger off and watch an hour of football while visits took place. So, Sunday afternoons in 1971 and 1972 at the RUH in Bath were often spent watching the domed head of Brian Moore introducing games from White Hart Lane, Upton Park, Selhurst Park, Highbury and – sometimes – Stamford Bridge. It acted as a little respite from the dullness of Aunt Nell rambling on about her recent operation or Mrs. Barton complaining about the hospital food. I can picture the large black and white TV screen, high on a stand. The hushed reverence while people watched. In fact, the day room always seemed to be packed with men, presumably seeking solace away from the never-ending amount of chattering in the main ward. It seemed like a little private club. I am sure that not everyone were fans of football though. Some, no doubt, were using it as a refuge. I can distinctly remember an interchange that took place one afternoon between my father and one particularly gormless relative who had been watching the football on TV for a quite few minutes before we arrived in the day room. My father asked him who were playing. I agreed. It probably took me a couple of seconds to work out the ground, the home team, the away team, even allowing for a kit change. Once at the RUH, I specifically remember Don Rodgers, the moustachioed winger, playing for Crystal Palace in the days when their kit, also, included the West Ham colours of claret and blue, and putting in a ‘man of the match’ performance against Manchester United. No doubt, there were sightings too of Osgood, Hollins, Bonetti, Garland, Hutchinson, Mulligan, Hinton et al on various Sunday afternoons. That era was a fine one for a young lad from Somerset to first get into football. It is widely regarded that the early ‘seventies were the height of the fashion for show-boating entertainers. Not every team could win a trophy, although the league seemed ridiculously open compared to recent times, but my goodness there was some fun along the way. These were heady times. It is no doubt a cliché, but the game was full of characters. Most teams had at least one luxuriously gifted player. We had several; Peter Osgood, Charlie Cooke and Alan Hudson were our three entertainers. Elsewhere, there was Frank Worthington, Tony Currie, Stan Bowles, Rodney Marsh, George Best and Derek Dougan, plus many more. In the modern era, there are – of course – entertaining players. In recent years, we have been blessed with Gianfranco Zola, Joe Cole, Arjen Robben, Juan Mata and Eden Hazard to name a few. However, the focus is slightly different today. Entertaining players today use their skills to an end; to get past markers, to aid the team. In those days, there seemed to be a slightly different approach. As an example, wingers had an almost rabid desire to go on ridiculously mazy dribbles with the sole intention of entertaining the crowd rather than assisting towards a goal. Or there would be a ludicrous lobbed pace into the path of an attacker. Or occasionally a little passage of head tennis between team mates. Or a deftly disguised back heel with the sole intention of making the opponent look stupid. These days, football is all about results. In those days – God, I feel old – footballers tried to entertain too. At 7.15pm, the three of us were lined-up in front of the Peroni pump in The Goose, waiting for Lorraine to serve us. We rarely drink in the front section of the pub. It seemed odd to be there. It also seemed odd to see the lads traipse out past us, one after the other; we had only just arrived and they were already off. Then, that ridiculously rare occurrence; Rob leaving the pub before me. On the Tuesday, I had read that tickets for the game were still on general sale. This worried me. Despite the claims of others that we are anything but a big club, we have played to virtual sell-outs for ages. Despite my warning about missing the kick-off, we arrived just in time. Kris and I sat next to Alan and Tom with about a minute to spare. As always, I checked to see if there were any empty seats. To my great surprise and pleasure, The Bridge was full yet again. However, there was a section of around three hundred empty seats in the West Ham section. “That’s poor” I commented to Alan. When was the last time Chelsea failed to take a full three thousand to any London derby? It was so long ago that I can’t remember. Soon into the game, there was the inevitable “WWYWYWS?” being bellowed at us by the sub-3K West Ham fans. As the game began, Vince arrived in the seat in front. He used to have a season ticket for a few years. I hadn’t seen him for a bit. He was in Albert’s seat, who is in New Zealand for two months. I asked him about his twelve year old boy. …glum faces from Alan and me. Prior to the game, Kris and I had talked about our score predictions. I went for a 3-0 repeat of the game at Upton Park. After all, we were on a run of seven wins on the trot. In the away game, West Ham had been dire. I was hopeful of a good Chelsea win. The game began. Or rather, the cavalcade of missed chances and missed opportunities began. Rather than list every one, here are the highlights, or perhaps the lowlights. After the ball broke to Willian, he sent a superb deep ball over to Oscar on the other side of the West Ham penalty box. The slight but deceptively strong Brazilian cut inside and struck a magnificent shot goal bound. Sadly, Adrian tipped it over the bar. A fine pumped ball from Branislav Ivanovic was headed down by Eden Hazard into the path of Samuel Eto’o. Sadly, the shot flew high over the bar. And it is their song; they were the ones who first sang it, that section sings it more than any other parts of the stadium. This is a first; I’ve never known one song to be favoured by one section of the stadium over all other areas. We had begun reasonably well, but as the game continued we struggled to maintain the same levels. A Ramires rising drive flew over. Just before the break, a Willian corner was headed towards goal by John Terry, but the ‘keeper did very well to kick the ball away. Then, Eto’o found an inch of space inside the box but his firm blast was turned around the near post by Adrian. The second-half began with several Chelsea chances, beginning with a Hazard strike from an angle. Again, it flew over the bar. With every tackle that took place, with every West Ham foul, the noise levels increased. The referee – he wasn’t familiar, who was he? – kept showing restraint in booking any West Ham player despite numerous opportunities. There is nothing like a sense of continued injustice to help raise the noise levels a few notches. At times, it was a cracking atmosphere. I was doing my bit. I was enjoying the fact that the home crowd were singing hard for the team. After all our pressure, West Ham broke down our right, quite against the run of play. The ball eventually fell at the feet of the hapless Andy Carroll who thankfully miss-cued. A goal then would have been hard to take. Still the chances came and went. I lost count of the number of weak shots right at Adrian. Very often, West Ham ‘doubled-up’ on Eden Hazard. He continued to be our main threat. Willian, was full of running, but his end product was poor. Mourinho made a double substitution; quite a surprising one, too. On came Lampard and Matic. They replaced Mikel and Azpilicueta, but Ramires moved to right back and Ivanovic to left-back. I, for one, would never have guessed those moves. Lampard provided more forward thrust, and soon found himself inside the box but his shot was blocked. Mourinho made another move. Oscar made way for Demba Ba. I was convinced that someone – ANYONE – would score the all-important goal to give us the win. The chances still flew high and wide. After a bursting run from Eden Hazard – we are so lucky to see his runs deep into the box from our vantage point in the MHU – a poke from Ba, close in, and we hit the near post. This was just ridiculous. The West Ham ‘keeper went down and we suspected time-wasting. The whole game had been riddled with this particularly unsavoury Allardyce tactic. He did it at Bolton and he is doing it at West Ham. I presumed that a free-kick had been awarded, so waited for it to be taken. Samuel Eto’o obviously misheard or misunderstood the signals – or whistle – and ran in from outside the box to slam the ball in just as Adrian was presumably about to take the kick. Then, there was a perfect chance for Frank Lampard to settle it. That man Hazard dribbled past some defenders and played the ball right into the path of the on-rushing Lampard. This was it. We inhaled. The ball was hit right at Adrian. With this, many Chelsea fans decided to leave. They missed even more absurd misses. Eden Hazard, receiving the ball from Ivanovic, decided to opt for an alternative approach to get past his usual two markers. He drew them close and then offered them a pack of playing cards. Both of the two defenders took a card apiece and Hazard then returned them to the pack. There was the usual shuffle of the cards. The two defenders stood bemused. With a flash, Eden then reached down to the socks of both players and pulled out the two cards which the West Ham defenders had originally selected. They stood, hands on hips, and then looked towards each other with a look of pure amazement. Spotting his opportunity to act, Hazard raced past the defenders and crossed, only for the ball to hit Samuel Eto’o on the arse and the ball flew past the post. Ramires, getting more and more annoyed as every dash through the West Ham midfield resulted in a succession of badly-timed tackles, opted to use another sport to defeat the opposition. He caught the ball in mid-air, stuffed it up his shirt, began whistling the Harlem Globetrotters’ theme tune, and then dribbled into the six-yard, bouncing the ball like Curly Neal, before slam dunking the ball over the bar. John Terry, the master of the chest pass, took his own personal trademark move to ridiculous lengths. The referee signalled a free-kick in the “D” after a thigh high challenge by Noble on Ivanovic. With Lamps and Hazard eyeing up a strike, John Terry joined them. After a heated conversation, involving lots of gesturing, Frank and Eden withdrew. John Terry lined up the ball, stepped to one side and then threw himself at the ball, sliding on the floor and making contact with the ball with his chest. The ball moved forward no further than a couple of feet. The West Ham ‘keeper was, inevitably, untroubled. Lampard, breaking through after a great ball from Gary Cahill, was met by a strong challenge from Kevin Nolan. Frank fell to the floor, with Nolan falling on top of him. After a little light grappling, Frank heaved himself up, decided that animosity was not the way forward, pulled a bouquet of blue carnations out of his shorts and offered them to the West Ham midfielder as a peace offering. Nolan smiled, lifted them to his nose and inhaled. During that lapse in concentration, Frank seized his chance. He whipped past Nolan but then miss hit his swipe at the ball and fell over. It just wasn’t our night. Back in The Goose, we were pragmatic about our wasted chances. On another night, we would have scored six. However, this was a similar story to the Stoke game. We miss a goal scorer and we miss him bad. West Ham – 1 shot. With Manchester City winning 5-1 at Tottenham, there was a general consensus that the league this year might be beyond us. Manchester City remain the firm favourites. No doubt. In fact, the two points that we dropped against West Ham might turn out to be irrelevant in the grand scheme of things as City might run away with it. The point that West Ham secured, though, might just keep them up. After a long delay on leaving London, I eventually reached home at 1.30am. There was the usual run through of the photographs I had taken, plus a scan of the internet for post-match opinions. A quick examination of my photographs revealed that, in fact, West Ham had only sold around two thousands tickets; it was Chelsea fans in that final section in the Shed Upper. That made the draw even harder to stomach. This entry was posted in Season 2013-2014. and tagged 2013-2014, Childhood, Parents, West Ham United by Chris Axon. Bookmark the permalink.